Choosing a tripod is always a compromise. No matter how much research is done, you are never quite sure that the choice you are about to make is the correct one. And even after you've used your tripod for over a year, you might still be uncertain of your choice. Whatever decision you finally make will be fine since you will learn to adapt to the few compromises that you knew you had to make. Don't start second guessing yourself and read more reviews after you have made your decision as other models will always arrive the day after your purchase. It's up to you to decide which feature is the most important, second important, etc. There is a rating list at the end of this article to help you come to the right tripod choice. Now, what are the features that you should look for? The carbon-fiber tripod offers the greatest weight to stability ratio against the more common aluminum tripod. The carbon-fiber model will also be easier to hold during those cold, winter days. Unfortunately, the carbon-fiber tripod will come with a much higher price tag. If you can afford the price tag, it is an item that you won't be replacing and won't regret using. If you cost average the price against how many years you will be using it, it might become the one to think about after you realize all the compromises that you had to consider on similar models. If you end up replacing a tripod that didn't fit your needs, the extra cost of eventually purchasing another tripod might cost you the same price. 3) The folded height (figure 2 #2). You have 2 options regarding the maximum height. The tripod with camera can be at eye level to you or the tripod and camera combination can be less than eye level. 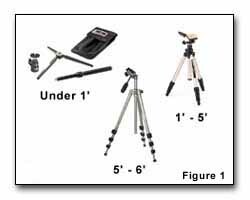 The tripod that is less than eye level is generally referred to as mini or compact tripod. The tripod that is less than eye level is generally lighter as long as equal construction materials are compared against one another. This tripod tends to fold up into a shorter unit for carrying or packing. You will generally regret choosing a shorter model as you will constantly be bending over or lowering your body to photograph. Do not get confused and add the height of the centerpost into the height of the tripod as it is meant for minor adjustments, and when raised too high, it tends to make the tripod less stable. Usually the choice of a shorter tripod is considered when weight and cost becomes a factor. Obviously, with a lightweight carbon fiber construction, the weight decreases and the price increases. The tripod that is right for you is the one that does not stay at home due to the tripod's weight or the size. The smooth centerpost is extended by holding the centerpost and raising it. The geared version has a small crank on the side, and when turned, raises or lowers the centerpost. The geared version allows you to raise or lower the tripod with one hand which is for some, and advantage. There is also an option with the smooth centerpost. Some manufacturers allow the centerpost to be removed and turned upside down so that the camera can be closer to the ground... upside down. This feature comes in handy some times. If you feel that this might be of value, then consider the smooth centerpost. Tubular models are almost always heavier, resulting in a longer life span and a more stable support. The legs usually have 2, 3, 4 or 5 sections. The tripod becomes less stable with more sections added while the tripod's folded height becomes much shorter. The sections of the legs are adjusted by means of a leg brace, the more common types being either a flip-lock or clamp lever (figure2 #3) or the threaded twist lock (figure2 #1). Threaded twist locks offer good strength and rigidity, but take longer set-up and breakdown time. They are also subject to over tightening and can pick up sand and grit. Flip-lock or clamp levers are generally the most satisfactory overall because of quick set-up, trouble-free operation (easy to use with gloves), and long term durability. The type of locking device is usually a personal decision since there are many pros and cons for each type of locking device. 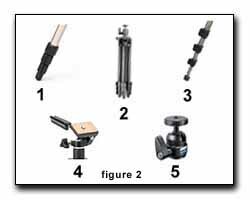 Some tripods allow you to unscrew the bottom of the legs to produce a pointed end for outdoor use. When the feet are set to normal, the legs have a rubber bottom for indoor use. The single handle head was originally for movie and video cameras that required horizontal positioning only. The two handle head has the ability to adjust both horizontal and vertically so that you can position your camera at the exact position necessary. They also make good general purpose heads. The other choice is the ball head (figure2 #5). Frequently, ball heads are used for bird and wildlife photography. A ball head will perform well under these shooting conditions where photographers sometimes leave the controls slightly loose with the friction set just tight enough to hold the camera steady, but loose enough to make smooth adjustments to moving subjects. This allows unprecedented ease of following a rapidly moving target. Some manufacturers also have "tensioning" devices to control the ease with which the ball can be rotated. This is desirable as once the weight of your camera/lens combination increases it can be awkward if the ball is completely loose. The bigger the ball, the more likely it will be to behave this way. Check the diameter of the top of the tripod to make sure that the ball head will fit properly on top of the tripod. Some heads have a larger diameter and overlap the top of the tripod. If in doubt of your choice, check with the manufacturer of the tripod or numerous retail stores to receive advice. A common mistake is to not allow enough room for your lens to clear the platform on the tripod. Be sure that your all the lens that you own or intend to purchase will not interfere with the extended platform. The lens may not be able to be adjusted to all positions. A platform that is about 2x2 or 2x3 should work properly. Test this out in advance before purchasing a tripod. I believe that the head, camera and tripod should be tested as a complete unit before a purchasing decision is made. It has been my experience that this is the only way to prove the utility of the tripod and head with the actual camera(s) being used. I think you would be surprised that some systems that you think are "solid" with one camera system, are wobbly with another. The quick-release system should be added to your tripod. This allows you to quickly and efficiently remove or mount your camera on your tripod. If possible, mount your camera on the tripod that you are considering. Stomp on the ground next to your tripod and watch the camera lens move. Then, jiggle the leg of the tripod and watch the camera lens. You are looking for the least amount of lens movement and the quickest recovery (how long does it take the lens to stop jiggling). The smaller or lighter the tripod, the harder it will stand up to this stability test. What type of photography do you want to use the tripod for? How are you going to be transporting your tripod? How far are you going to be transporting your tripod? How heavy is my camera and will lens be added? How much do I want to spend for the tripod? How much do I really want to spend for sharp photographs? What is the order of the most important feature to the least? Can I buy it and try it from the inside of my house? Can I take it back if it doesn't meet my needs?